If you are looking for a little light entertainment on the web this week I may have a couple of sites for you. Both are related to the way you look, and at how others look at you, and you can participate too. The first site is called All Look Same. The site contains a type of quiz. You are shown photos of people, places, art etc and you have to decide whether they are from China, Japan of Korea. At the end of the test you are given your result with the appropriate advice regarding learning about other cultures. The exam room contains 8 different categories, from food to architecture, urban scenery, traditional architecture and modern art, but the really fun one is faces. Can you tell the difference between a Japanese face and that of a person from Korea? Take the test to find out. There are also a couple of sections of holiday photos that really give a run out to your perception neurons. The second website is somewhat related as it too deals with faces. The Facity site grew out of a project based in Berlin and Tel Aviv, and now covers a multitude of cities. The idea is simple, a series of photos of faces from an individual city, so why not play a game with your friends, show them a page of faces and try to guess the city. First you can play with your friends, and then why not participate? There are specifications for the photos but the only rule about joining in is that you must live in the city in question, and there are already 100 cities involved. The list of cities is interesting because it really shows how communication takes place. The faces tend to be clustered, as I presume groups of friends get together and take the photos and then upload them. Milan has hundreds, as do Berlin and Istanbul, but London only has one, miles behind the mighty city of Robbinsville in New Jersey and Targu Mures in Romania. 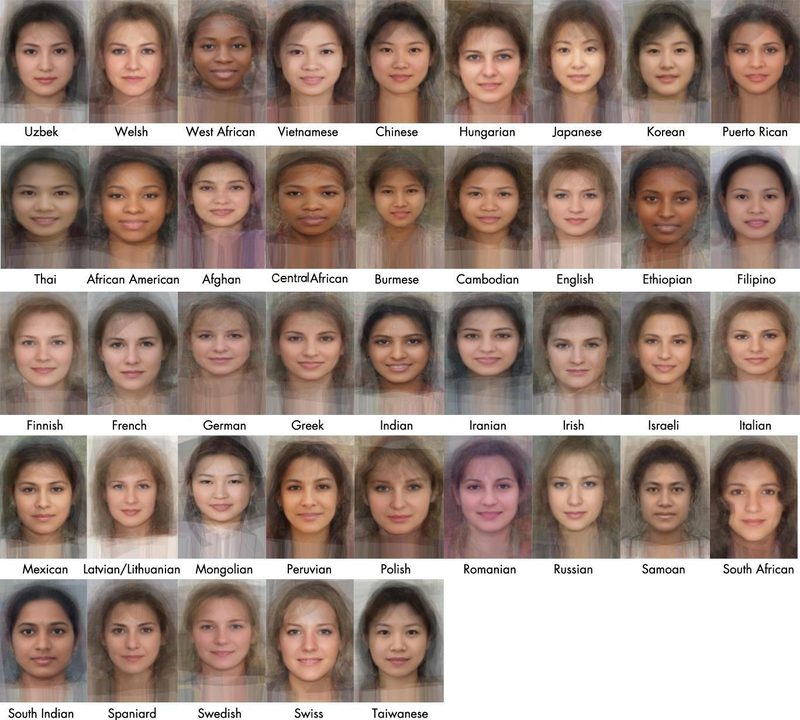 Check out the average face section too, as in the photo above of average women’s faces created through a process of comparing single points in many photos, an interesting project I would say. So why not add your own? Tell them that Technology Bloggers sent you. I used to think I was pretty good at identifying the types of Asians just by looking at their faces. They only look the same if you don’t know how to see the differences. Imagine that we are looking at cows for example, all of the same breed. They all look the same to you and me but to a cow breeder they are very different. A vet can look at one of them and tell you that it is ill because they learn how to see when an animal is ill. Look up a book called Skilled Visions by Cristina Grasseni, it is about learning to see, an apprenticeship of vision. I am sure that a Korean can recognize another Korean, as I can recognize an Italian or someone from Manchester in a crowded room. I guess you are right. It depends on the type of people you have grown up seeing and are familiar with. This is indeed a very interesting characteristic about us humans. The above picture is a great representation of the contrast in physical characteristics of people from different countries. It really brings out a subtle comparison between them.